I trust the first month of 2013 is treating you well, if not…. well the future is in your hands so make it work for you! As for the common persons new years resolutions, if you had any I hope you’ve stuck to them and if being more healthy and fit was one of them, I have a few healthy snacks to help you get through the day. Eating healthy shouldnt need to be a chore, these snacks can be made in just 5min. 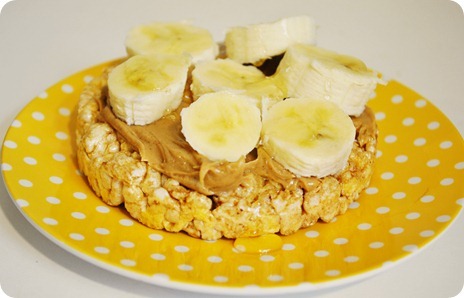 – Spread a tablespoon of natural peanut butter on a rice cake, then add some sliced or mashed banana on top of that before adding the second rice cake on top. – This is ideal as it is a high-energy snack that is packed full of potassium, fibre and healthy fats. Peanuts are also full of essential nutrients, such as protein, vitamin E, folic acid, niacin, B6, folate and thiamin. – The fibre in bananas not only keeps digestion regular, but also helps maintain low blood sugar and curbs overeating. – Prick the skin of a medium-sized sweet potato (300 grm) with a fork in a few places. Place it on a plate and microwave at full power for about five minutes. Once cooked through cut the sweet potato open and sprinkle it with cinnamon and a sprinkle of brown sugar, honey or a sweetener. – Sweet potato contain beta-carotene, a phytochemical used to make vitamin A, as well as loads of vitamin C to boost your immune system. 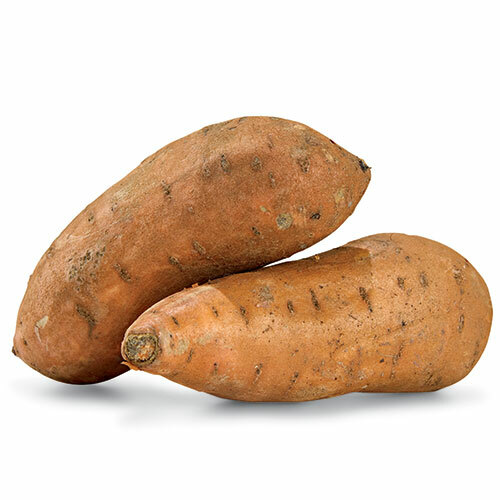 – Sweet potatoes are high in Vitamin B6. Vitamin B6 helps reduce the chemical homocysteine in our bodies. Homocysteine has been linked with degenerative diseases, including the prevention of heart attacks. – Spread some fat-free cream cheese onto a whole-wheat tortilla. 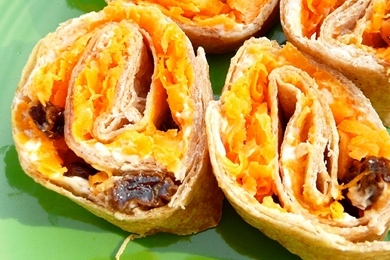 Add some grated carrot and raisins before rolling it up and slicing into 10 ubite-size pieces. – The sweetness of the carrots and raisins make it taste like a treat, without the guilt. Carrots are also rich in betacarotene, which is converted into vitamin A in the liver, while raisins are a good source of fibre, calcium and healthy sugar energy. – The potassium and magnesium contents of raisins help reduce acidity (an abnormal metabolic condition known as acidosis) and remove toxins from the body, which may cause diseases such as arthritis, gout, kidney stones and heart disease. – Fill half of a whole-wheat tortilla with lean slices of biltong, sliced tomato, lettuce and a small wedge of avacodo. As all the ingredients are served cold so you can prepare and eat this snack in under 5 minutes. – The meal provides the ideal mix of fibre, protein, and heart-healthy fat. 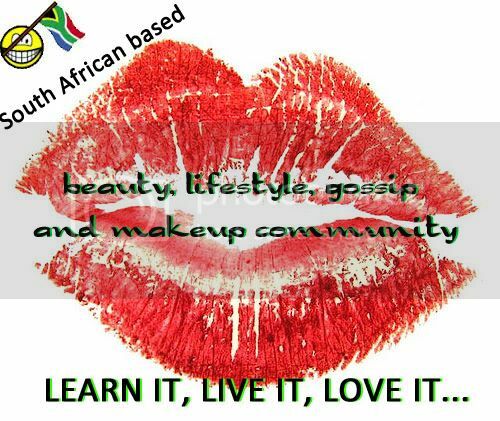 – Biltong is a high protein and low-fat snack. Because biltong has been dried and cured, it is light to carry yet contains a power pack of valuable nutrition, making it ideal to take everywhere. So Poutlings, instead of that dreadful chocolate, or a packet of chips, try these delicious snacks.